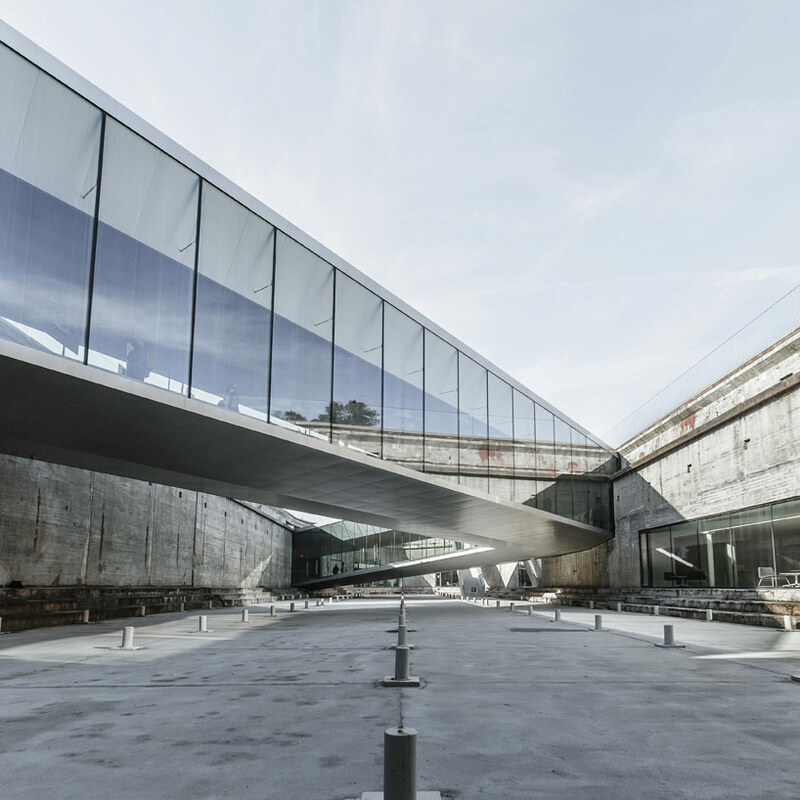 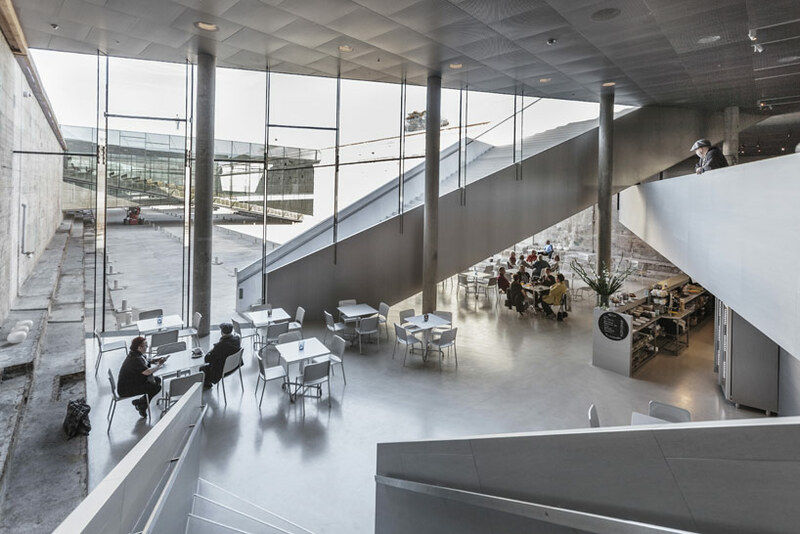 BIG in collaboration with kossmann dejong, rambøll, freddy madsen and KiBiSi have completed the danish national maritime museum in helsingør. 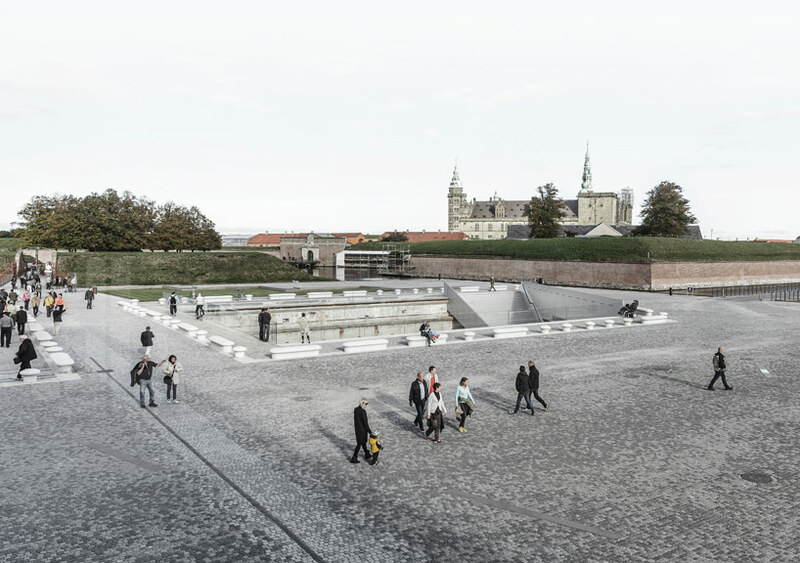 combining the existing historic elements with an innovative concept of galleries and way-finding, the scheme reflects denmark’s historical and contemporary role as one of the world’s leading maritime nations. 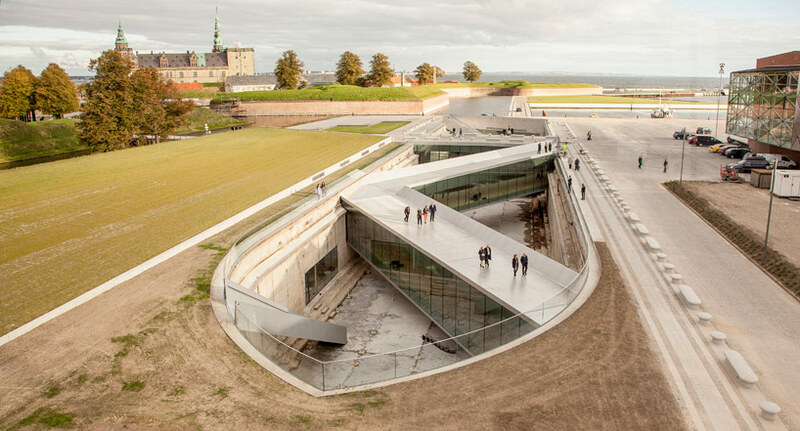 located just 50 km north of copenhagen the 6,000 m² (65,000 ft²) museum is situated next to one of denmark’s most important buildings, kronborg castle, a UNESCO world heritage site – known from shakespeare’s hamlet. 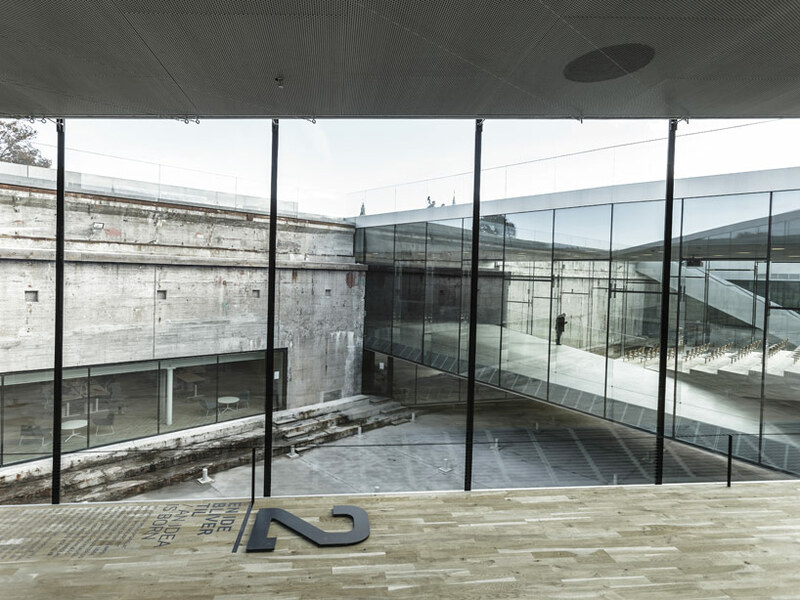 a series of three double-level bridges span the dry dock, working both as an urban connection, as well as providing visitors with short-cuts to different sections of the museum. 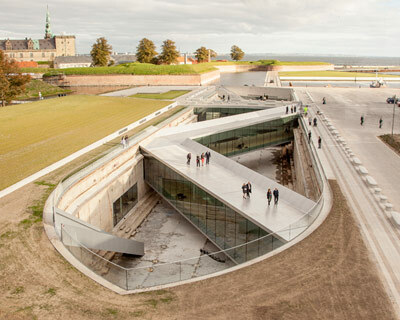 the harbor bridge closes off the dock while serving as harbor promenade; the museum’s auditorium acts as a bridge connecting the adjacent culture yard with the kronborg castle; and the sloping zig-zag bridge navigates visitors to the main entrance. 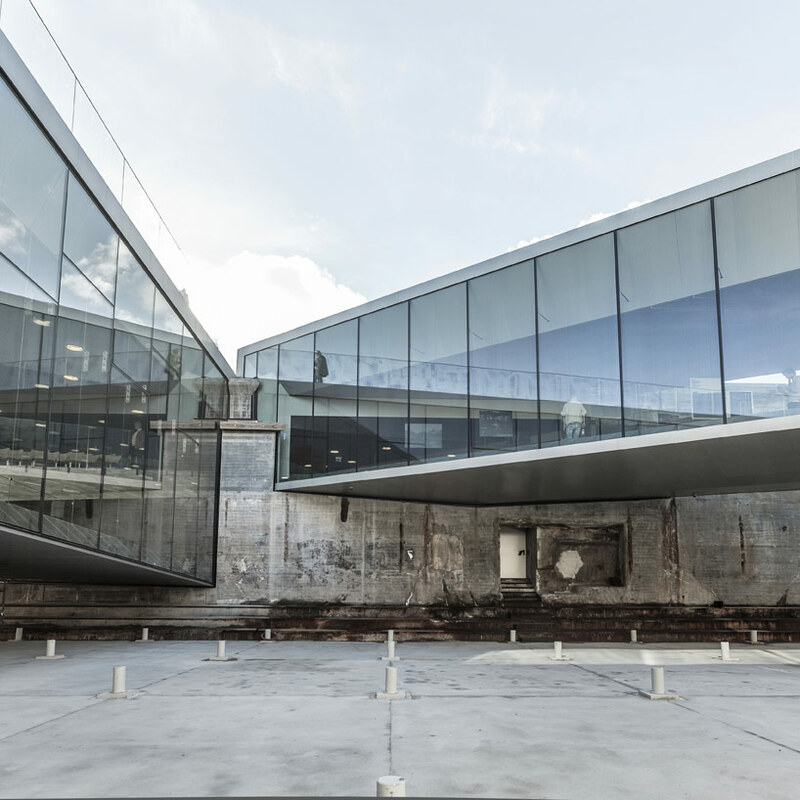 ‘by wrapping the old dock with the museum program we simultaneously preserve the heritage structure while transforming it to a courtyard bringing daylight and air in to the heart of the submerged museum. 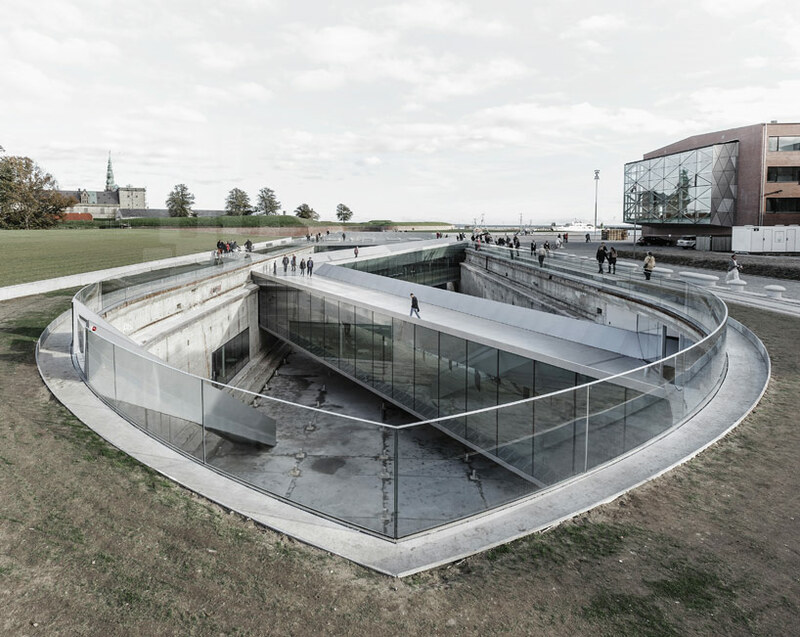 turning the dock inside out resolved a big dilemma: out of respect for hamlet’s castle we needed to remain completely invisible and underground – but to be able to attract visitors we needed a strong public presence. 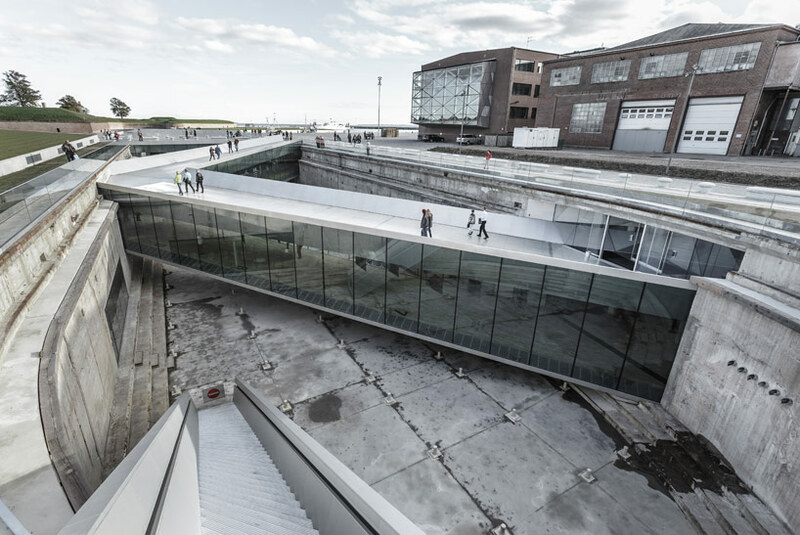 leaving the dock as an urban abyss provides the museum with an interior façade facing the void and at the same time offers the citizens of helsingør a new public space sunken 8 m (16 ft.) below the level of the sea.’ says bjarke ingels. 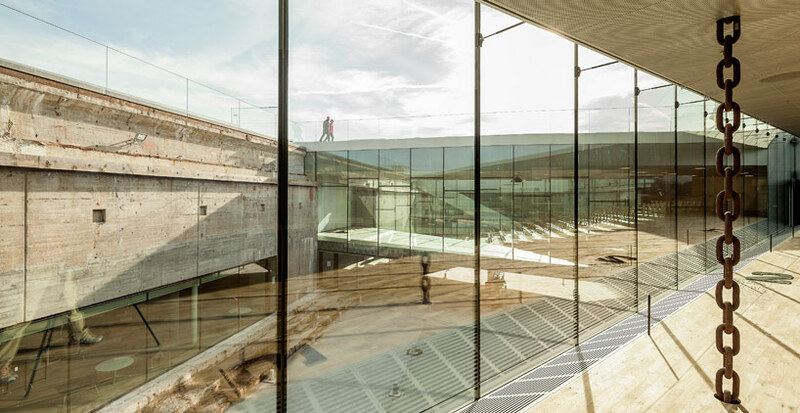 descending into the museum space, the bridge joins together the old and new elements of the site, as one is offered views out to its surroundings. 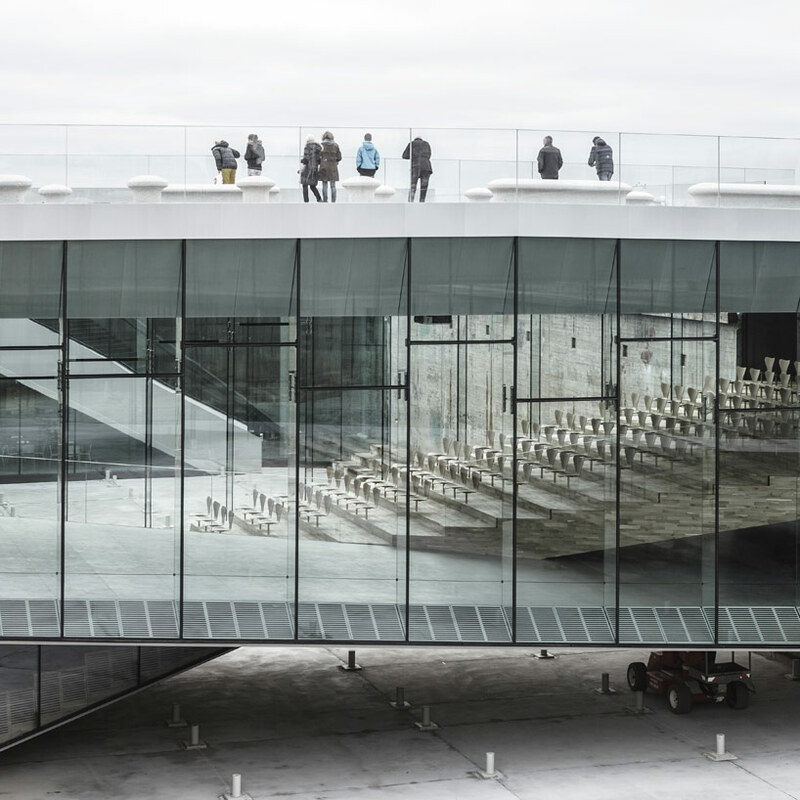 unfolding in a continuous looping motion around the dock to 7m below ground the history of the danish maritime is displayed. 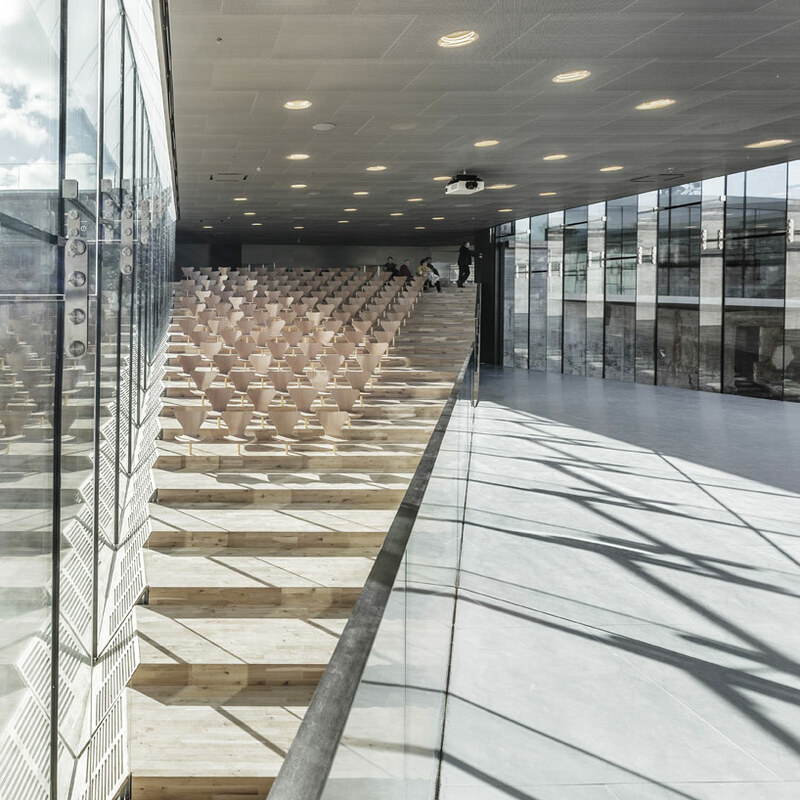 the slope connects all the floors – the exhibition spaces with the auditorium, classroom, offices, café and the dock floor within the museum.